An aircraft maintainer demonstrates the Auto-Scan: Inlet and Exhaust Damage Registration Sensor. 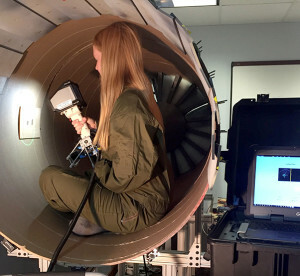 This tool, developed through an AFRL Critical Small Business Innovative Research contract with Intelligent Automation, Inc., provides a faster and easier way to characterize inlet and exhaust damage in high-performance aircraft. The Air Force Research Laboratory Materials and Manufacturing Directorate, along with small business contractor Intelligent Automation, Inc., has developed and demonstrated a unique tool that will make routine aircraft engine exhaust inspections faster and more accurate. The Auto-Scan: Inlet and Exhaust Damage Registration Sensor was developed through a $4 million Critical Small Business Innovative Research contract with Intelligent Automation, Inc., for the development of a tool to quickly and accurately characterize inlet and exhaust damage in high-performance aircraft. These specialized aircraft routinely experience high temperatures and extreme operating conditions, necessitating regular inspections and maintenance. Typically, these inspections have consisted of visual analysis and manual trace and transfer plotting of damage occurrences. The process usually involves more than one maintainer and several hours of labor. These manual methods can lead to inaccurate or incomplete interpretation and human error. The Auto-Scan sensor provides an automated and easily-implemented solution to the inspection problem. The tool is operated by one maintainer, capturing an image of the surface defect, and determining its shape, outlining the perimeter, and calculating its area, depth, location, and orientation. This information is then transferred to the aircraft’s health assessment system for further analysis. By using this tool, maintainers can characterize, localize, register, and transfer information about damage and defects, speeding up the inspection process, improving data accuracy, and minimizing operator-induced error. Following the successful demonstration of the Auto-Scan tool, AFRL is now transitioning it for operational deployment to the field as part of a $2.5 million Rapid Innovation Fund effort.